Happy Day After Thanksgiving (if you're in the U.S., otherwise just happy Friday)! We had a slow school week full of appointment prior to Thanksgiving. Amber completed all the skipped assignments, except science, from when she was sickly last week. She's got a test up next in science and we're having trouble finding a good time for it. It's amazing, but we have stuck with a literature program longer than a couple of months. We are both still enjoy Illuminating Literature (we are alternating it with poetry). Amber made good progress through A Friendly Persuasion and most probably will finish it this coming week. However, I'll just be happy to have it finished prior to Christmas. 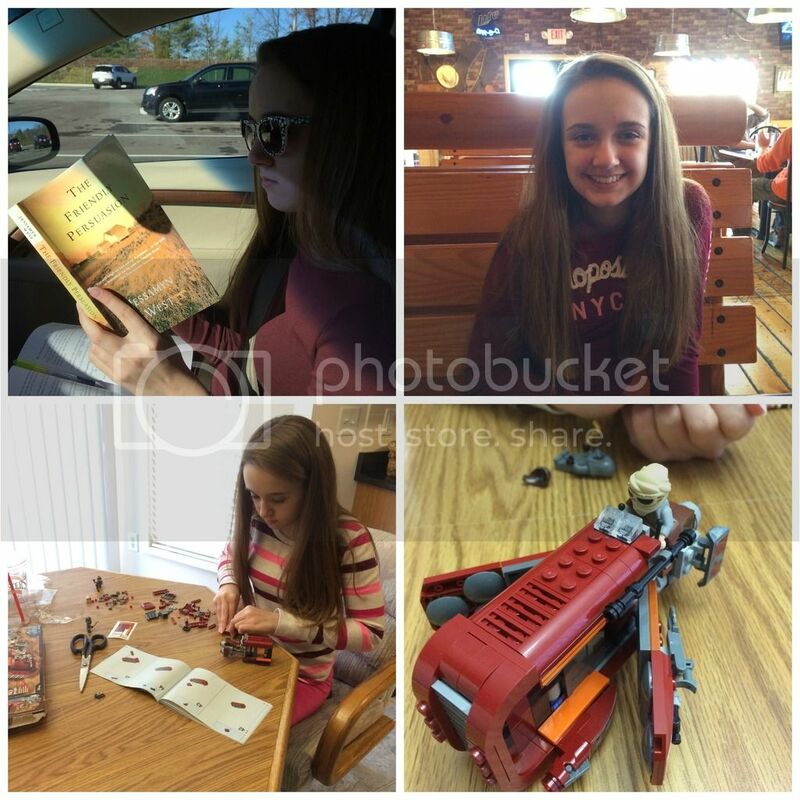 Literature in the car, lunch between appointments, and building her newest Star Wars LEGO set. Thankfully, Amber has recovered from the virus itself, but it triggered an overall autonomic nervous system malfunction that is still going on. Not much is working correctly yet, so we've spent more time trying to support her body than anything else. We did have a nice Thanksgiving at my sister's house with special allergy food for three of the eight people. Then in the evening the kids put on another of their plays with paper puppets they made that afternoon. Amber had pretty much run out of steam by the play performance so it was a bit lackluster on her part. Of course it was still cute, especially with the sleepy four year old doing his own thing the whole time. We were shopping for Christmas clothes, but found Stitch instead. She's loved Stitch almost her whole life. We couldn't pass it up. 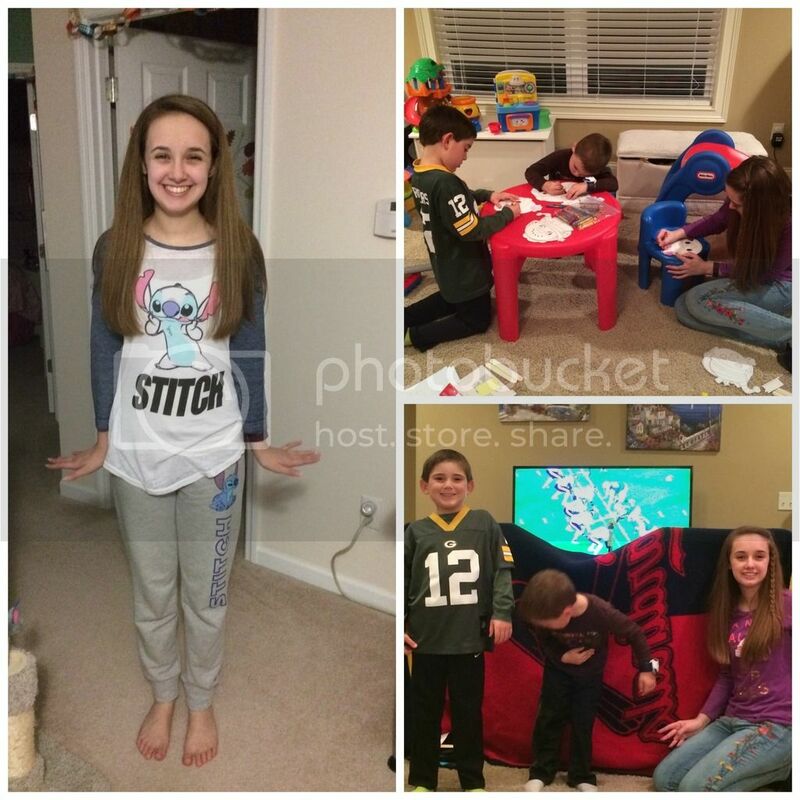 And Thanksgiving fun with the cousins. Today we are driving the almost 2 hours home in pouring rain trying to stay ahead of a freeze line that wasn't supposed to even exist according to the forecasts. Actually, Fred is driving while I'm being nervous and writing this post on my iPhone to distract myself. This weekend we will decorate our home for Christmas as is our tradition. Amber is giddy with anticipation and looks forward to this weekend each year. Although we don't have a new set to add to her LEGO Winter Village this year since LEGO decided to reissue the first set as this year's addition, Amber will still put out and play with the rest of her village over the month of December. My view on the drive home. Then lunch after making it safely back. 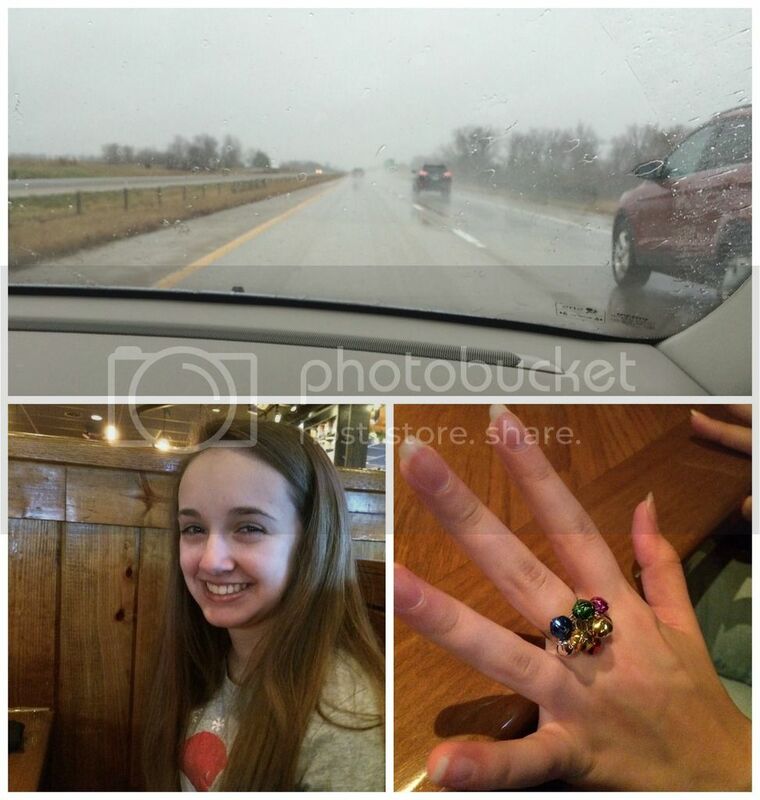 Plus Amber's new jingly ring from her aunt and uncle. I also must find time to bake and freeze safe food for Amber and plan out independent school lessons for next week. Tuesday is my awaited gallbladder removal surgery. I'm praying it truly can be done laparoscopically, otherwise I'm going to be out of commission a lot longer than planned. This weekend also marks the beginning of Advent and we are finally going to be prepared with our devotions and activities - for once! We will need to give ourselves a little grace for surgery day, but pick right back up the next day (or maybe two days) later. Knitting and more knitting on gift projects. 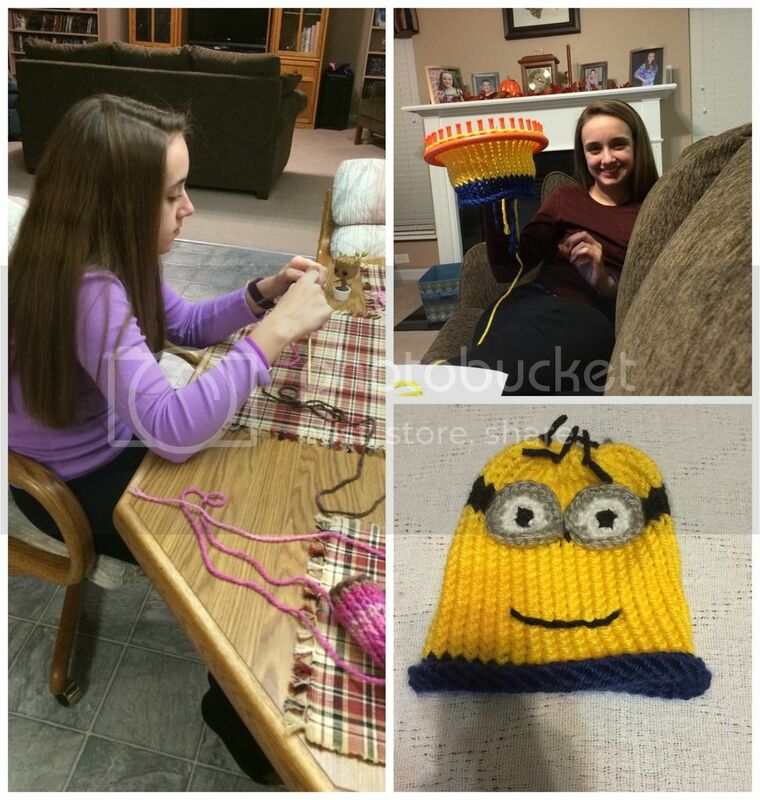 She finished the Minion hat for her cousin - this was her own made up pattern! By now, you've probably figured out we did actually make it home through the raining drive without and it was without incident. There was even a tiny break in the rain and temperatures were still above freezing. Whew! The kitties survived 24 hours without us, but were not pleased with us for being gone. Amber and I have even managed to dust the entire house this afternoon in preparation for decorating tomorrow. That's it for this week. Hopefully I'll have good news after the surgery for next week! I will be praying for you on Tuesday. I hope it all goes very well. The minion hat is adorable. Tell Amber she is very talented. I hope Tuesday went well. I LOVE the hat - your daughter is really clever!